Check out if Femmes Africa Solidarité is in The Top 100 NGOs 2013 Edition! 15 years of expertise and impact. The result of a brainstorming session held in Geneva amongst a group comprising female lawyers, judges, academics, entrepreneurs and representatives of NGOs and international organizations, Femmes Africa Solidarité was born in late 1996 as a means to increase women’s participation in conflict prevention and resolution. The organization is committed to strengthening capacity at the grassroots level, while at the same time ensuring that women are involved in the central decisionmaking processes that shape post-conflict settlements. Femmes Africa Solidarité is uniquely situated – as an organization forged by African women leaders – to support and strengthen the role of Africa women in the peace sector from the ground all the way up to the top tier of its long-established international network. The organization’s efforts are focused on five areas of intervention: advocacy, solidarity missions, capacity-building, democracy promotion and justice for women. Femmes Africa Solidarité favors interventions in sub-regional areas – such as the Mano River, Great Lakes and Horn of Africa – where its expertise enables maximum impact. 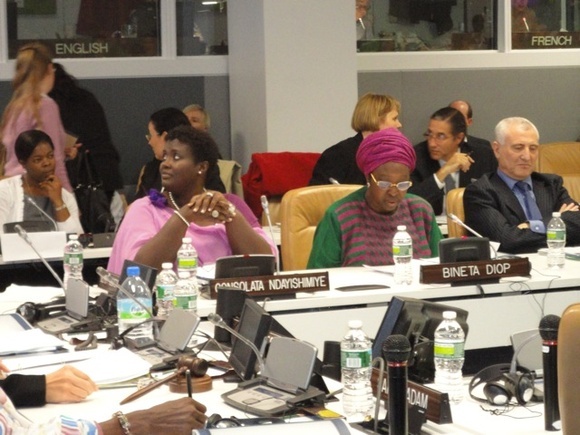 The organization’s accomplishments include establishing the Mano River Women’s Peace Network, which brought leaders of Guinea, Liberia and Sierra Leone back to the negotiating table in the early 2000s, and conflict resolution training for Burundian women who participated in the Arusha Peace Process and negotiations in 1998.